There is a mention in the Ramayana that Vali defeated Ravana badly. When and how did it happen? During the duel, why didn't Ravana use any of his divine weapons? I think Vali did not possess any divine weapon. Ravana, having heard of a very powerful vaanar Vali, went to Kiskindha to fight with Vali; but was told by Sugriv and others that Vali had gone for sandhya-vandana at Dakshin-Samudra. Ravana could not wait and went there. He, mischievously from behind, wanted to grab Vali in his arms when Vali was busy doing sandhya-vandana. But Vali noticed him coming from back and was quick enough to take Ravana's head into his armpit. Holding Ravana in this postion, Vali traveled in air quite a long distance and finally came back to Kishkindha. Ravana, having been captured so tightly in Vali's armpit, was totally exhausted by that time. He praised Vali's strength and made him his friend. Having heard slight sound of Ravana's footsteps; Vali understood that now Ravana, extending his arms, wanted to get hold of him. Then as a Garuda catches snakes, in the same way; Vali, despite having his face turned on other side, grabbed Ravana. Thus, Vali caught king of Rakshas (Ravana) into his armpit and flew into the sky with great force. 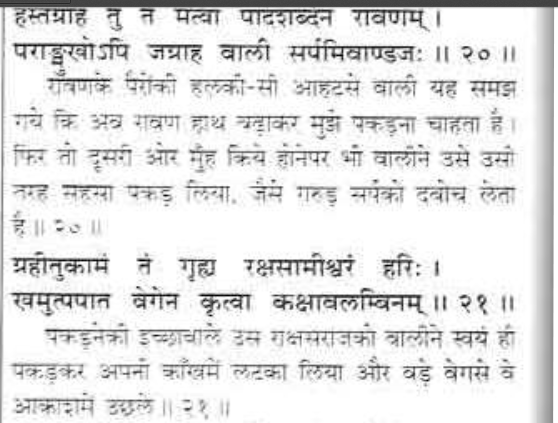 Here is the detailed source (34th sarga) from Valmiki Ramayana, Uttar Kand. The incident is being described by Sage Agastya ji to Shri Rama. In addition to Uttara Kānda of Rāmāyaṇa, the story of Vāli defeating Rāvaṇa is also mentioned in Chapter 7 of Upodghāta pāda Brahmāṇḍa Purāṇa Upodghāta pāda. It is mentioned how Vāli defeated Rāvaṇa effortlessly. The Vānara king Vāli once defeated Rāvaṇa. He caught hold of him with his left hand. Placing him at his side, he pressed him hard and he went on meditating. In the course of a muhūrta, he went to the four oceans, the southern, the eastern, the western and the northern, meanwhile touching all the four sides. He had the speed of wind but he was not exhausted (He did not feel strain of the long travel.). Due to the firm grip of Vāli, Rāvaṇa fell unconscious. Vāli put him under a tree and sprinkled some water on the body of Rāvaṇa(from head to feet) and pretended to be surprised when Rāvaṇa regained consciousness(but he was proud of his strength). If you read the above incident, you will understand that this was totally one-sided. This wasn't a duel. Rāvaṇa didn't compete at any stage. Vāli didn't use any of his weapons. He just used his physical strength. No weapon is used by Vāli. In fact, he never used any weapon in the combat with his brother Sugrīva. He then speaks to Rāvaṇa in a surprised manner and reminds him of his past achievements. He asks how and why he was defeated by a Vānara like him. Freedom from fear has been given unto you by me. Rest assured. You have nothing to fear. It is true that I have defeated Devas and asuras. But I have never come across a powerful man of this sort(like you). I wish to make a friendly alliance with you, devoid of fear of every sort. O heroic warrior, never will a fight ensue with you from my side. Vāli also agreed with this and they entered a treaty. This made Rāvaṇa happy. He returned to Lanka along with his hordes. In this way, the fight between Rāvaṇa and Vāli took place and pride of Rāvaṇa has been broken. Bāli had got a boon from the Gods that he would get half the strength of his opponent who stood face to face with him in fight. This power enabled Bāli to defeat all his foes and bring the countries in all directions under his sway. Ravana heard about this and decided to overpower Báli somehow or other and approached Kiskindhā, Bāli knew this. His minister, Taran, went to Rāvana and told him about the power of Băli and of the boon by which Bāli got half the strength of his opponent. When Rāvana heard of this peculiar boon he decided to kill Bali. His idea was to kill Bāli by going behind him when he went to the sea-shore to take bath in the morning. Next morning Băli went to the eastern sea-shore and began his prayer and meditation. Rāvana approached Bāli from behind and sat close to him. Perhaps the idea of Rāvana might have been to take Bāli by his tail and beat him on the ground. Bāli knew that Rāvana was sitting behind him. But pretending that he knew nothing put his long tail on the body of Rāvana, and passed it lengthwise and breadthwise through every part of his body and tied him like a bundle of faggots, and made a jump into the air. within a short time he visited all the usual places and reached Kiskindhä. Seeing Rāvana hanging by the tail of Bali, even the women folk laughed. Thus Rāvana admitted defeat. Bāli let him go unhurt. I believe the above story is present in some Sanskrit version of Uttara Kanda of Valmiki Ramayana and that has not been translated into English yet. Notice that even in English translation of Uttara Kanda at archive.org, Ravana approaches Vali with silent steps. Now why would a powerful king like Ravana approach his opponent silently from behind? So maybe there's some truth to the boon Vali had that "he would get half the strength of his opponent who stood face to face" and Ravana was simply trying to avoid a confrontation so he had a better chance of defeating Vali. One more theory is that Baali have power that anyones who came to fight with him lost his half power to Baali itself which makes him much more powerful than he was. here in wikipedia the same thing is mentioned: https://en.wikipedia.org/wiki/Vali_(Ramayana) ,Vali was famous for the boon that he had received, according to which anyone who fought him in single-combat lost half his strength to Vali, thereby making Vali invulnerable to any enemy. and you will surprise to know that he travelled for six months with ravaana in his armpit. Not the answer you're looking for? Browse other questions tagged mythology ramayana ravana vali .